This past Sunday, I joined Crew teammates, Mike Keefer, Travis Saeler and Daniel Atkins for stop #2 in the Michaux Endurance Series for 40 miles of the best single track in the world at The Curse of Dark Hollow. As we line up in the Masters wave, I see several-time Masters winner Jay Dodge; fast starter and always a threat, Michael Funk; newcomer and winner of the 2011 Michaux spring race, Paul Wojciak; and on single speed, my friend Bernie Shaio, whom I just edged out last time we raced in Michaux. To have any shot at the series title, I need to put some time into Paul and Jay and at least hold even with Bernie and Mike. I’m going to have my hands full today. We’re off up the 1/2 mile 4% grade gravel road climb to string things out. Nobody seems to want to go that hard. It’s going to be a long hot day and it’s already close to 80 degrees. Jay takes over at the front with me on his wheel. We come through the start-finish area, dive into the woods briefly, and then back out to gravel. About 2 miles in we make a hard left up a super steep technical climb. I follow Jay and he looses traction and has to dab. Paul and I are off too since we’re right behind him. Mike chose a better route off to the left and stays on his bike. It’s so steep that re-starting seems daunting, so we hike. By the time we get to the top, Mike Funk is gone… up the trail in first position. The first twenty miles were surprisingly enjoyable! The terrain was awesome and the effort was very controlled. Paul, Jay and I rode much of it together at a just-below-tempo pace chatting and sharing the front. Nobody was attacking. However, with half the race gone, it’s starting to seem unlikely we’ll catch Mike without some changes. Besides, Bernie can’t be far behind and I’ve got to try and get rid of my companions at some point… it is a race after all. Just after the 2nd rest area, there’s a long gravel road climb. With both front and rear shocks locked out, mostly standing in the big ring, I burn some matches by laying down about 15-20 minutes just above threshold. At the top of the climb I glance back, Paul is dangling, but Jay is gone. I’m feeling pretty good today! We’re back in single track now and the elevated pace has us catching and passing riders. This is one of the best parts of the course; bumpy rocky single track with bermed sweepers created by moto tires ripping out of corners. It’s not buff, but with the right groove, it’s got flow in a raw Michaux sort of way. My Trek Superfly 100 is loving this trail and it’s making me a better rider than I actually am. Big wheels, light weight and full suspension; this bike goes down hill fast. After about 15 minutes of descending bliss, my arms are tired and Paul is gone. I back off a little and try to recover a bit and ride efficiently. After several miles, on a fast rocky double track descent, I see Mike Funk on the side of the trail starting to fix a flat. Bad luck my friend, you were having a great ride. So with 15 miles to go, just like that, I’m in the lead. Sweet! At mile 28 or so, I catch Michaux local Travis Coldsmith and bearded single speed mountain bike legend Topher. I am having a good day! We ride together for awhile, but after a steep hike-a-bike, Topher is gapped. Travis and I exchange positions several times. He schools me twice on technical Michaux rock features. I’m getting tired. I fill my bottle at the last aid station and try to summon some enthusiasm for a strong finish. It’s pretty hot now and and I’m just trying to ride steady. We’re passing riders from the 20 mile loop. On the final set of gravel road climbs I pass Jim Wilson the director of Team CF, and later a guy who says he reads this blog! Sorry I don’t have more time to chat, but I need to try and put some time into my rivals. I cross the line 5 minutes ahead of Paul and 6 minutes ahead of Bernie in 4:23, good enough for the Masters win! Congratulations to Brandon Draugelis or Team CF for the overall win in the men’s open at 3:48. 29er Crew Teammate Mike Keefer finished 2 minutes later for 2nd and my rock star friend Chris Beck apparently nipped fellow Crew member Travis Saeler for third. Congratulations to you all. 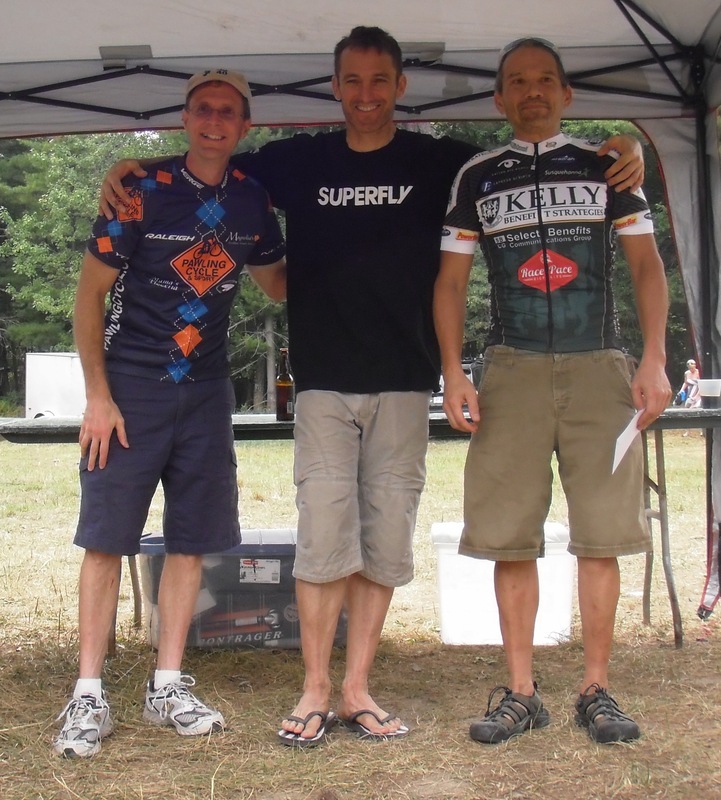 In the single speed, Harlan continued his series winning streak at 3:52, with Justin Pokrivka getting 2nd at 3:59. Travis Coldsmith hung on for 3rd at 4:22 less than a minute in front of me. Single speed rocks! Those are fast times. In the women, the queen of Michaux, Cheryl Sornson, won at 4:30 with Team CF teammate Carolyn Popovic taking 2nd. Well done! Finally, in the vet, my friend and travel companion Jed Prentice shook off some mid season funk to take the win at just under 4 hours. Nice ride. Next up, the Wilderness 101 in Coburn PA. This entry was posted on July 25, 2011 at 8:57 pm and is filed under Must do Races. You can follow any responses to this entry through the RSS 2.0 feed. You can leave a response, or trackback from your own site. Nice work Roger. I wish I had a fraction of your literary skills. Great Read. I didn’t see your email on here and would love to ask you a few questions about the NUE series.